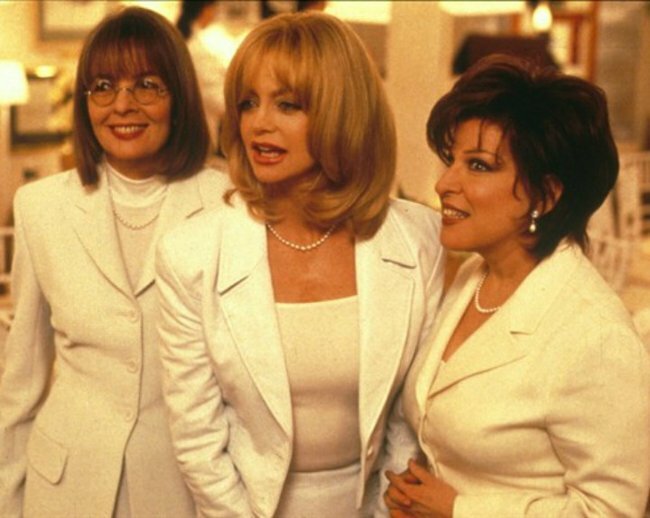 The First Wive's Club stars are reuniting for a new movie. The First Wive's Club stars are reuniting for a brand, spanking new movie. If you needed one more reason to join Netflix, we’ve found your tipping point. The film and TV streaming platform announced today that First Wive’s Club stars Goldie Hawn, Bette Midler and Diane Keating will be reunited on screen in a Netflix original film called Divination. Let’s hope there’s more like the iconic performance of ‘You Don’t Own Me’ from First Wive’s Club (watch below). Post continues after video. This is the first time the trio have featured in a film together since cult-classic First Wive’s Club was released nearly two decades ago. “We were all women of a certain age, and everyone took a cut in salary to do it so the studio could make what it needed. We all took a smaller back end than usual and a much smaller front end. And we ended up doing incredibly well. The movie was hugely successful. It made a lot of money. We were on the cover of Time magazine,” 70-year-old Hawn told Harvard Business Review in March. Watch Bette Midler and Goldie Hawn discuss First Wive’s Club below. Post continues after video. Netflix have been producing their own original television shows for a few years now, think Orange Is The New Black, House of Cards, yet this is one of the first films the streaming giant have announced. It will join serious Academy Award contender, Beasts of No Nation and Adam Sandler’s The Ridiculous Six. A release date is yet to be announced, but we can assure you, we’ll be glued to the screen with a glass of bubbly when it is.